This information won’t be given out over the phone. You must come to the police department and ask in person. Do you do civilian fingerprints for employment? Yes. To make an appointment, contact Crime Analyst Brenda Emch at 330-729-2013. The cost for fingerprinting is $32 for BCI, $34 for FBI and $66 for both BCI & FBI. Do you have prescription drug drop-off? Yes. We have a “Drop Off” container located in our police lobby available 24/7. We can not take any liquids or needles. You can contact the police department at 330-726-4144 and have an officer come see you or you can come to the station and speak to an officer. How do I obtain a police record? Call our Record Department at 330-726-4144 ask for records. They are available Monday through Friday from 8 am to 4 pm. How do I get my car out of vehicle impound? Call the Record Department at 330-726-4144, Monday through Friday, and they will give you the information. Call our dispatch center at 330-726-4144 for non-emergency situations or come to the station and talk to an officer. If it is an emergency call 9-1-1. No. Due to the potential for damage to vehicles, the police department does not open locked vehicles. If a child is locked inside the vehicle, the police and/or fire department will respond to remove the child from the vehicle by force. 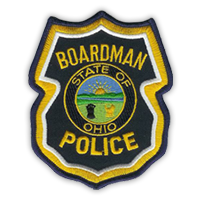 Are arrested persons kept at the Boardman Police Department? No. They are taken to the Mahoning County Jail. Call the Mahoning County Jail at 330-480-4950. 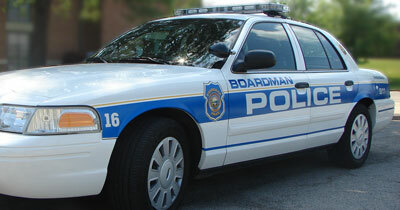 Does Boardman Township have a noise ordinance?